Thank you for supporting Solutionary Rail! We are so grateful for friends and collaborators like you championing Solutionary Rail our bottom-up campaign for sustainable transport and renewable energy infrastructure that benefits all. 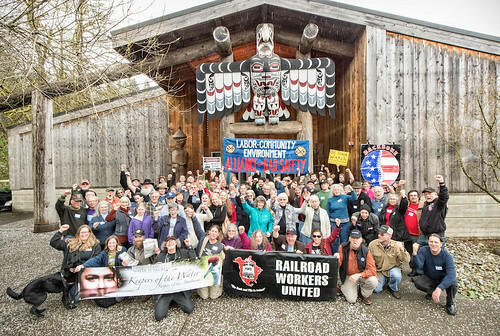 We know that only together can we build a grassroots alliance to mandate a common sense program for the future of U.S. railroads that serves the common good, workers, communities and the environment. Take the opportunity now to let us know how you might like to help this campaign as we move into the next stages of releasing the Solutionary Rail book, organizing a grassroots tour and roadshow in communities along the Northern Transcontinental rail corridor, and advocating business and elected officials seriously pursue this innovative solution. Fill out the volunteer form HERE and let us know your gifts, passions, and offerings of support. Share the petition to Governor Inslee for the first time or once again with more friends and family. Then, encourage family and friends to pitch-in at the Solutionary Rail book crowdfunding page.